Jane Franklin has always been a controversial figure. Some see her as a calculating egomaniac, trying to rule a colonial empire through her weak husband and, after he vanished in the Arctic, bullying the Admiralty into sending out one unnecessary search expedition after another. Others perceive her as the devoted, loving wife ready to sacrifice everything she had to bring back the love of her life or at least find out what happened to him, conjured up in the powerful but most likely imagined image of her on the shore of Orkney, arms outstretched to the North, willing her hero to come back to her. The truth, like always, lies somewhere in between. To find out where exactly is almost impossible although Jane Franklin kept an extensive diary throughout her whole life, recording even the smallest detail. Unfortunately after her death her personal papers and correspondence were heavily edited by her constant companion, friend, secretary and executrix of her will, her niece Sophia Cracroft. Numerous books have been written about John Franklin, his last expedition and also about his wife. Erika Behrisch Elce, professor for Victorian Literature and Culture at the Royal Military College of Canada, has herself added to this scholarly library of Franklinite literature with a non-fiction book about the letters Lady Franklin wrote to politicians, friends, Royal Navy personnel and everybody else who she thought useful in the quest for her husband lost in the Arctic. Now, almost ten years later, the author presents an epistolary novel about Lady Jane Franklin, following partly the lines of this extraordinary woman's life who, although she left school at 16, possessed an active and intelligent mind that made her a restless traveler, venturing into territories where not many of her contemporaries dared to go, especially if they were female. As the author mentions in her book it has always been widely discussed how much John and Jane Franklin were in love with each other. Of course, it is possible that she just looked for a tolerable husband and he for a mother to his young daughter but on the other hand there is enough evidence in their letters that they had feelings for each other and formed a team of equal partners. Especially in Van Diemen's Land (today's Tasmania) Jane shared John's load, supporting him with advice, taking care of correspondence and being there when needed – if she was not away on one of her excursions. How much she pushed her husband to become the governor of Van Diemen's Land, a post he was too good-natured to be suited for, or to take over command of his last expedition at the age of 59, is also a question that cannot be answered. Franklin himself, however, seemed to have been keen on both posts. After Franklin and his expedition had not been heard of for more than two years, Jane Franklin rose to form, peppering with letters every human being or institution who she thought would be useful in sending out search expeditions. When she had the impression that letter writing was not enough, she invested a large part of her fortune (to the chagrin of John Franklin's daughter and her husband who feared Jane would waste Eleanor's inheritance on a fruitless task) and sent out her own expeditions. With every new ship that left for the direction of the Arctic she and other friends and relatives of the officers and crews sent letters to their loved ones in the hope they would reach them. No letter ever did and the ones that survived to this day are testament to desperate hope crushed by each "Returned to the Sender" stamp on the envelope when it came back. Jane Franklin's letters to her husband are no exception. "I write also to apologize to you that we have been at least a little worried while you've been gone, but, really, this is to be expected. It is nothing out of the ordinary for a wife and daughter to worry for an absent husband and father – not lost but gone almost, almost too long." Still, up to that point it had been expected not to hear from the expedition and Jane Franklin, like almost everybody else, must have felt that the men would be back every day now as triumphant conquerors of the North West Passage, one of the last blank spaces on Earth waiting for the Royal Navy to map, name and take into possession for Queen and country. "Are you surprised that I continue to write to you even now that I know that you are dead?" "I write to tell you that there are no more Eleanor Franklins in the world. Do not be downhearted about it – your young Eleanor continues living – but no longer under our collective wing. No: this month, she at long last married her Gell, and that's an end on it. Of course she was beautiful in her way, with her simple gown and homely looks…"
One feature of the book appealing not only to readers interested in fiction but the scholar as well are only very slightly edited Times newspaper articles and letters to the editor that give a fascinating insight into how the Franklin search was seen in the public eye but also how openly Lady Franklin and Sophy fought against critics from the public and their own family. They also provide context and background information to the fictitious letters. As the title suggests, Russell Square in London plays a pivotal part. Jane grew up in adjacent Bedford Place in her father's house and often stayed there even after her marriage. When they came back from Tasmania, Jane and John Franklin again shared the house with Jane's ailing father and the family of her sister Mary, the Simpkinsons. It must have felt quite crowded in there and was not made better when, after Eleanor left to get married, Sophia Cracroft, who was no relative of the Simpkinsons, came to live with Lady Franklin permanently. In Lady Franklin of Russell Square, the reader gets a glimpse of how claustrophobic it must have felt for Jane and Sophy (and the Simpkinsons) until they finally decided to move out in 1854 and take up lodgings in Spring Gardens in close proximity to the Admiralty. In the novel Jane keeps going back to the solace of Russell Square and the statue of the Duke of Bedford as her confidant and collaborator since her childhood days, greeted even by the mature Jane with an elaborate ritual. 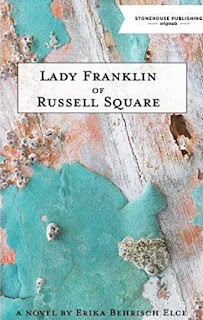 Jane Franklin's gentle friendship with the Russell Square gardener (who is tormented by his own dark past) is a captivating side story but unfortunately not drawn out to its full potential. The reader is left longing for a more substantial interaction between the two as the author decided to take the story a different direction. Thus a few dialogues and their mutual love for unassuming flowers have to suffice to show two lonely people longing for the happiness of the past. The novel ends with the departure of Leopold McClintock in the Fox without covering its return and the information it brought on the date of John Franklin's death. Lady Franklin of Russell Square adds another stitch to the rich tapestry of the Franklin expedition saga and enables the reader to imagine Jane Franklin in a more private, softer light as a flawed but dedicated person dealing with hope, despair and in the end accepting her fate and moving on.